A Lush Garden in Only Four Inches of Compost? You can tell how old this photo is. Black and white and I look a little younger, don’t I? This was my very first patio garden, raised up on sawhorses, had a plywood bottom (of course holes drilled for drainage) and all planted in the square foot system. This box is 4×4 and the wood that I used for the sides were 1″x4″ boards and you already know that a 4″ board by name doesn’t measure exactly 4″. It might have started out when they cut the lumber the first time as 4″ wide, but then as it goes through the sawmill its smoothed down to about 3.5″. So in actuality this garden has only 3.5″ of soil. 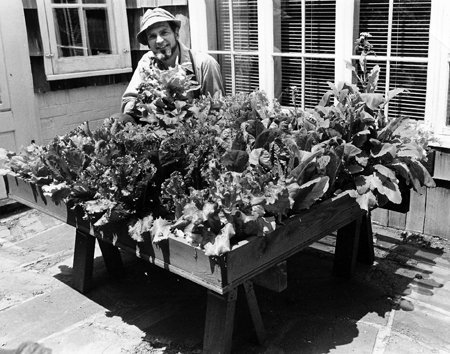 The experts of course told me, “You cannot grow vegetables in only 6″ and much less, 3.5″ of soil.” They said, “I don’t care how good your soil is or how much fertilizer you use…you can’t do it!” This was back in 1974, when I was just designing and experimenting with the new Square Foot Gardening system. I had not fully perfected the entire system yet and my soil was made mostly from pure compost from my home made compost bins. Well as you can see, the lush and abundant salad fixings which are grown in just that 3.5″ deep of nothing but home made compost. No fertilizers were used and none are needed in the SFG system BECAUSE – all the nutrients the plants need are in the compost. Just one of the reasons why SFG is so simple and effortlessly free. We say that you can have a large dinner salad every day from a 4×4 SFG box. Picture your plate right now and you have your choice to harvest from three kinds of lettuce. Beet leaves, swiss chard, carrots, radishes, onions, parsley, scalions – and that’s just a start! In that 4×4, you can grow 16 different vegetables and you can replace them every season so in most parts of the country you get three seasons and you’ll have 3×16=48 different vegetables. How many go in each square foot? 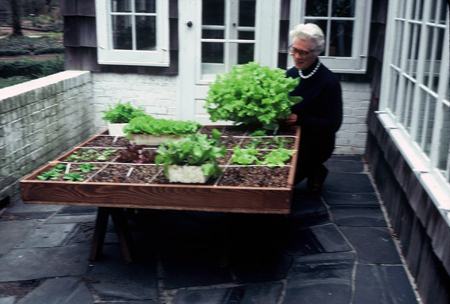 Well there would be four lettuce per square foot, nine beets per square foot, and sixteen radishes or carrots. Now show this box or photo to the expert that says you need lots of room, fertilizer, yearly soil preparation, hours of work every week. I, and so many others across the globe, are blessed that you didn't pay any attention to the nay-sayers. Thank you so much for your very meaningful comments. It just encourages me to keep thinking and making new improvements and not getting discouraged by the experts. Beginners and people like you are my biggest cheerleaders and fans. Keep watching and let me know how you like the new blog and subjects – I think you are my biggest fan right now! Do you have to replace Mel’s mix every year? No, Mel’s Mix can be used for up to 10 years! All you have to do is make sure you add compost after you harvest from each square. 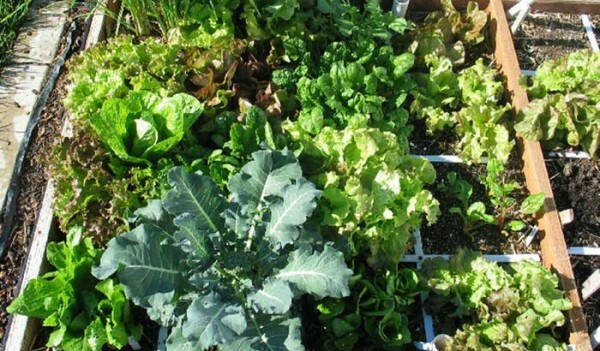 After 10 years you may want to add some extra vermiculite and peat moss to the mix along with some more compost, but you can use it even past then if you make sure everything is in the right ratio.